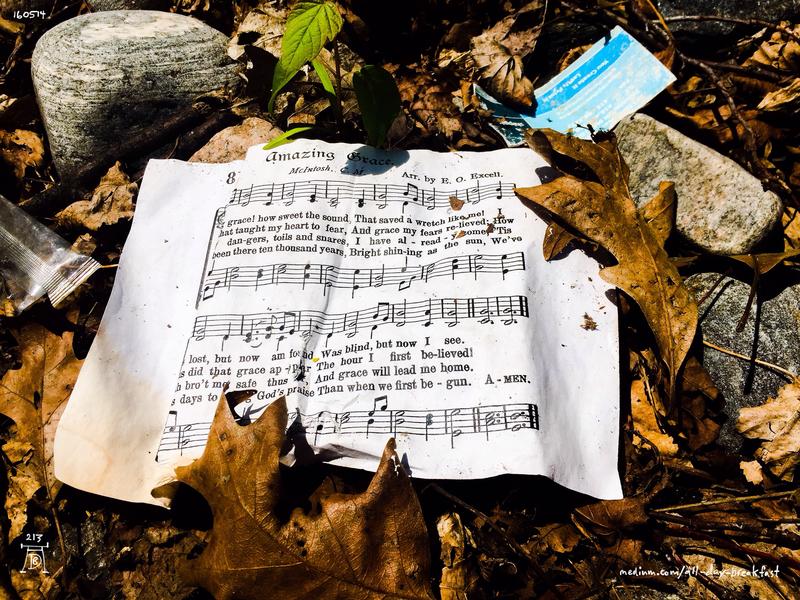 It is strange when a hymn from your childhood ends up as garbage on your front lawn. The detritus from recycling day has a tendency to drift into our hedges and dash itself on the garden rocks. Candy wrappers and old flyers are the norm. But Amazing Grace? As a young child, I was familiar with this song. That is to say, I was familiar with the melody and the words. I took the imagery as literal—this poor guy had gotten lost, probably because he was blind. Then God saved him, in the same way you might rescue a stray cat. It’s funny how you can know something so well, yet have no idea what it means. Reading this again, today, completely out of context on my front lawn, I see it as a redemption and testimonial. It’s a pitch: pick God and you will be favoured. Join us. Exalt! This is a narrative I chose not to participate in. Yet narrative colours every aspect of how we see our own lives, and how we feel about the world. We ascribe meaning to the events that occur around us. One person might see this event as a sign that God is trying to reconnect with me, to offer me respite and forgiveness. Another might see this as a symbolic representation of recycled ideas that have already been discarded. I just see a beautiful piece of trash that evokes a memory and provokes thought. All-Day Breakfast is a daily reflection on creativity and the human condition in the modern age. This is issue #213 of 555. Join the All-Day Breakfast Club newsletter for sporadic updates and more!